The WT210/WT230 has five times the high-frequency range and approximately twice the basic accuracy as the previous generations plus a high-speed data acquisition rate and a compact design make this digital power meter highly desirable. What's New: The WT210 is an Accepted Device by Standard Performance Evaluation Corporation (SPEC) used for Power Efficiency Benchmarking! For North American users please click here to learn more. The WT230's advanced specifications and its wide range of functions let you handle all your measurement applications from low-frequency equipment to high frequency inverters using a single power meter. 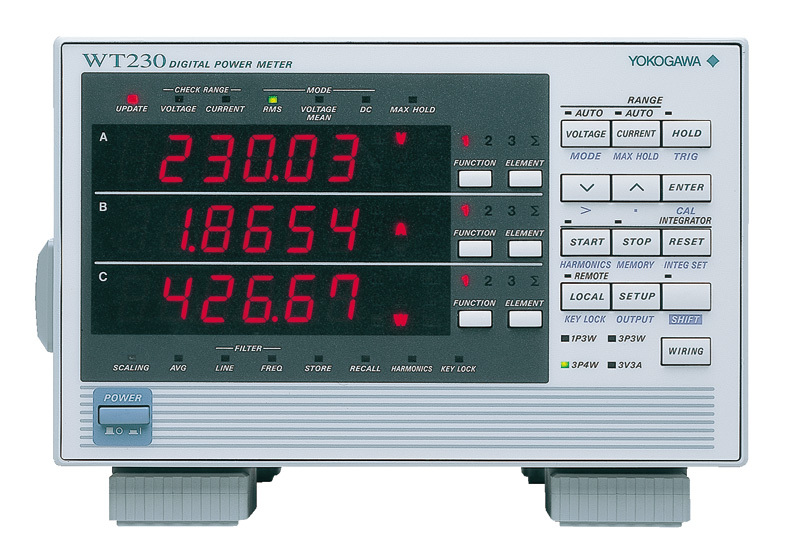 Click here to view a white paper on WT210/WT230 power meters. Low-frequency measurements starting at 0.5 Hz can be used for evaluations of cycloconverters and when a motor are started. Power accuracy is even better than in fomer WT200/WT130 series. Now you can obtain more precise measurements on high-frequency equipment such as inverters. This function lets you keep, on the display, voltage and current peak values, voltage and current rms values, and maximum values for active power, apparent power, and reactive power. 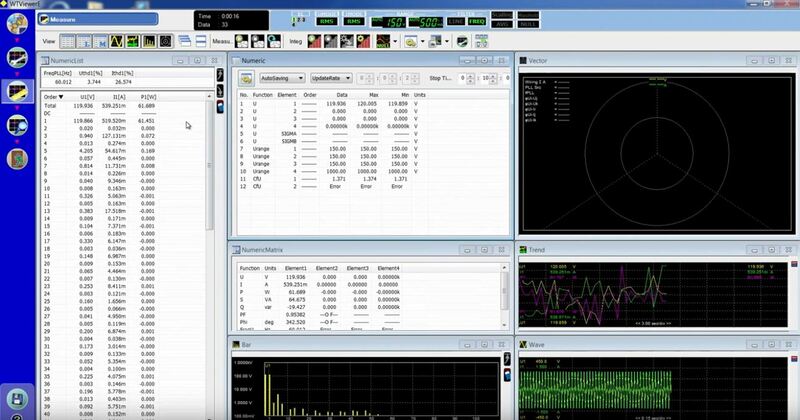 In addition to using DC inputs, you can obtain precise measurements of signals containing DC components, such as intermittent signals and half-wave rectification signals. With measurement intervals as short as 0.1 second, you can capture transient phenomena with a fine level of detail. You can also reduce the time per measurement for increased through put in production testing. This function lets you measure fundamental wave rms values for inverter output voltages. Instead of taking notes, you can use the internal memory to store and recall settings and field measurement data. *3: Popular functions on the WT200 were incorporated into WT210 and WT230. Time can be set between 1 second and 10,000 hours (416 days) in 1-second increments. Power and current values can be integrated separately for positive and negative polarities. Integrated values are shown with the decimal point moving according to the integrated value. The power of intermittent control equipment changes significantly over time. The average active power in intermittent operations can be displayed, which is highly effective for consumed-power measurements. The built-in 5 mA range lets you measure currents as low as 25 µA. This makes it possible to measure very low currents on such things as intermittent control equipment. The wide current range (5 mA to 20 A) means a single power meter can be used for applications such as Energy Star® measurements, to measure everything from standby-power to rated-power. Assured accuracy from 1% allows measurement of widely-varying power consumption with a fixed range. comparator is installed EXT HOLD and EXT TRIG are added. and INTEG BUSY are not added. All six signals listed to the left are added.